Prices are in Ghana Cedis (GHS). Payment can be made by MTN Mobile Money and goods dispatched by bus courier service. Our most popular product, sales have tripled in the past year and we are in process of registering it with Ghana Standards Authority for national distribution. At present, Kristo Buase “Swedish Bitters” are only available from the monastery shop. The origin of this herbal medicine is credited to Dr Phillipus Paracelsus, of Switzerland, who developed it in the early 16th century. The herbal mix follows a recipe that is at least 300 years old and which was written down by Dr Claus Samst, a Swedish Physician and Rector of Medicine, who lived in the 18th century. Dr Samst compiled a manuscript listing 46 conditions for which Swedish Bitters can bring relief.  Treatment of typhoid fever.  Removal of scars, wounds and cuts (moisten the scars daily, up to 40 times).  Frontal sinusitus (Swedish Bitters applied as a compress over the forehead, eyes and nose).  Restoration of appetite & stimulation of digestion.  Relief of swellings and joint pains.  Treatment of bruises, removes discolouration (as a compress).  Treatment of swellings from insect bites (as a compress).  Brings back lost hearing (a piece of cotton wool, moistened with Swedish Bitters, is put in the ear. Add a drop of oil to the ear from time to time to avoid itching).  Relief of pain (taken internally as, applied as a compress or massaged into the affected area).  Relief of arthritis (1 teaspoon of Swedish Bitters in tea taken three times daily).  Treatment of weariness and tiredness (1 teaspoon taken in water or tea taken internally, externally some drops are applied on temples, forehead, closed eyelids and the area behind the ears).  Warts, liver spots, corns, moles and haemorrhoids will disappear if moistened repeatedly with Swedish Bitters.  Cleanses the blood, improves circulation, dispels flatulence, headaches, indigestion, stomach, gallbladder, liver and kidney disorders.  Helps wounds heal (taken internally). SWEDISH BITTERS, ingredients: Swedish Bitters imported herbs & roots (Aloe, Myrrh, Saffron, Senna leaves, Camphor, Rhubarb roots, Zedvoary roots, Manna, Theriac venezian, Carline Thistle roots, Angelica roots) in base of Cashew-apple schnapps. 30% alcohol by volume. 350ml bottle, GHS 20. 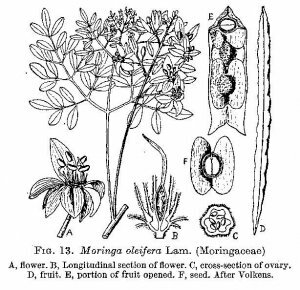 The moringa tree was originally native to India and north-east Africa. It has been widely promoted in Ghana in recent years as “The Miracle Tree” because of its many benefits. The leaves, seeds and root all have medicinal properties. The leaves have seven times the vitamin C found in oranges, four times the vitamin A of carrots, three times more iron that spinach, four times more calcium than milk and three times the potassium of bananas. The seed pods can also be used for the purification of polluted water in rural areas. The use of moringa is said to boost the immune system and control conditions such as migraine, skin complaints, arthritic pains, high blood pressure and diabetes. Our moringa products are all produced from trees grown on site and are chemical free. MORINGA TEABAGS, a mixture of moringa flowers and lea ves. Light and refreshing as a hot drink. Good for the control of fever, diabetes, high blood pressure, stomach-ulcers, high cholesterol and anaemia (moringa flowers are not recommended for women during pregnancy). Box of 25 sealed bags, hygienically prepared using a semi-automated tea-bag machine. GHS 6. MORINGA LEAF-POWDER, dried in suspended nets and double sieved by hand to preserve full colour and nutritional value. Can be used as an additive to soups and porridges, or sprinkled on food. Excellent source of calcium, vitamins and protein. Double bagged in heat-sealed polythene. 500g pack, GHS 20. MORINGA SOAP, made from moringa seed-cake, shea butter, silicate, perfume, disinfectant and soap base. Good for general bathing, treatment of skin diseases such as body-itch, rashes, footrot, ringworm, body odour and dandruff in hair. 200g bar, boxed. GHS 2. MORINGA POMADE, made from petroleum jelly, pounded fresh moringa leaves, shea butter, citronella oil. As a body and hair pomade, control of skin rashes and foot rot. Medium pot, 100 g net weight, GHS 5. MORINGA LIQUID SOAP, can be used for washing dishes or as a shampoo to control dandruff. The moringa extract is mildly antiseptic. Medium bottle, 400 ml, GHS 2. MORINGA SEED OIL (BEN OIL), mechanically extracted oil from the seeds of the moringa tree. Similar chemical composition to olive oil. May be used for embalming, anointing, massaging of body joints as a cooking / salad oil. Mild nutty taste. In Europe moringa oil is a major active ingredient of anti-aging creams. 1 litre bottle, GHS 300. JAMS, contain fruit, sugar, lemon juice and ginger. No artificial preservatives (refrigerate after opening). Varieties according to season: ORANGE MARMALADE, ORANGE AND GRAPEFRUIT MARMALADE, CASHEW, STARFRUIT (CAROMBOLLA), MANGO, PAWPAW. 500 ml jar, GHS 10; 370 ml jar, GHS 8. AVOCADO CHUTNEY, ingredients: Avocado pears, dates, onions, vinegar, sugar and spices. 580 ml jar, GHS 15. MANGO CHUTNEY, ingredients: Mangoes, dates, onions, vinegar, sugar and spices. 580ml jar, GHS 15. WINE, made from fermented fruit-juice of Cashew / Carombolla / Avocado leaves with sugar and yeast. 8% alcoholic content. 1 litre bottle, GHS 10. INCENSE (ENCENS DES MOINES), perfumed incense prepared by the Benedictine monks of the monastery of the Ascension, Danyi-Dzogbegan, Togo. Made from natural tree resins and essential oils, 200g packet, sealed in plastic, GHS 15. ROASTED COFFEE, ground “robusta” grains, prepared by the Benedictine monks of Dzogbegan abbey, Togo. Rich, full-bodied flavour. Suitable for use in filter or espresso machines. 250g heat sealed foil pack, GHS 22. THE LIFE AND RULE OF ST BENEDICT, Edited by Dom Ambrose Flavell, OSB. (Kristo Buase, 2006). 204 pages, paperback. Contains Introduction, Book 2 of the “Dialogues” by St Gregory the Great, translated by Fr Hilary Costello, OCSO; the “Rule of St Benedict”, translated by Dom Basil Bolton, OSB (copyright texts, reprinted with permission); a thematic compendium of the Rule by Dom Cuthbert Butler, OSB (translated from the Latin by DAF) and a Directory of all Benedictine and Cistercian Monasteries in West Africa and Cameroon with contact details. PRICE: GHS 10 (GBP 8 plus postage). THE HOLY BIBLE : TWERE KRONKRON. New Asanti-Twi translation of the New Testament commissioned by the Catholic Archdiocese of Kumasi, Twi and English in parallel columns. Printed in Great Britain. (New Word Publishing (GH) Ltd., 2013). Hardback, 549 pages. GHS 25. POSTCARDS of the Monastery, GHS 0.50 each.